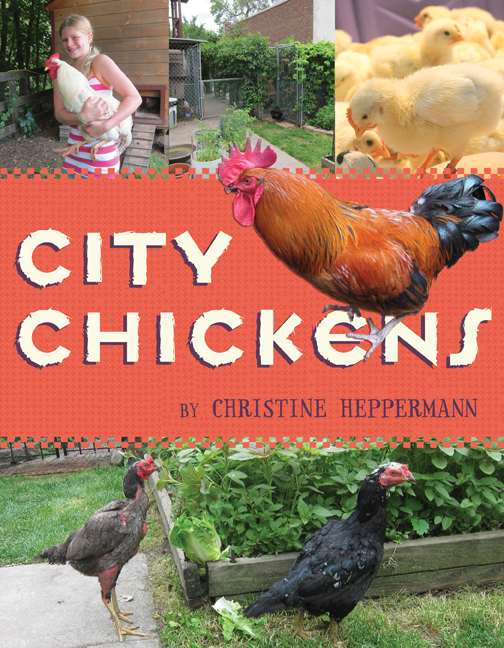 The tale of Chicken Run Rescue, a chickens-only rescue located in North Minneapolis, Minnesota, is the focus of the lovely, thoughtful book City Chickens, a copy of which I received from the publisher for review (Amazon affiliate link). Tracing the humble origins of the rescue, where all bird residents are referred to as guests, author Christine Heppermann tells the story of open hearts, beloved birds, careful work and many happy endings for some of the most mistreated creatures in our nation. At Chicken Run Rescue, guests have a pretty cushy life (often in contrast to the conditions they’ve previously experienced). They may roam indoors and throughout the specially created, chicken-friendly yard. Some even lay eggs under furniture! The comfort and safety of the guests are paramount at Chicken Run Rescue. The story takes us through the fortuitous meeting of Bert and Mary, the rescue’s founders, to their first guest, Henrietta, and beyond. The book highlights some of the stories of the many, many lucky birds that have come into Chicken Run Rescue’s loving embrace. Peppered with fantastic photographs of the appealing birds, Mary and Bert, and tales of treatment of chickens, one of the book’s most impressive strengths is that the author doesn’t shy away from discussing the need for a place like Chicken Run and other rescues. Material discussed includes issues that arise with the rise in popularity in backyard flocks– such as what happens when mail-ordered chicks end up being male, or a flock’s rooster keeps crowing, upsetting the human residents. A chapter entitled Unequal Treatment discusses the facts around factory farming and the over eight billion chickens raised for food in the United States, all in a very appropriate manner for kids to learn about and process. The revelations about life for birds living in factory farms are contrasted with the life that the birds at Chicken Run experience. There is also a brief and equally appropriate treatment of cockfighting. The book not only focuses on some of the birds during their stay at Chicken Run Rescue, its also highlights the lives of lucky birds who have been adopted out to caring folks. The Author’s Note is an interesting story within a story. Prepared to write a book on the rescue organization while maintaining impartiality, Ms. Heppermann found her businesslike demeanor crumbling in the face of the chickens she and her daughter met at the rescue. They eventually ended up adopting some striking chickens from Chicken Run Rescue! You can sign up to read the Chicken Run Rescue newsletter here. This book is highly recommended for elementary school-aged kids, though older readers will enjoy the stories around the life and times of rescued chickens. This is a very validating book for young animal lovers, especially vegetarians and vegans. It is wonderful to see a book about rescued chickens (and their champions) available from a large publishing house. Two crows for City Chickens! I’m so glad you reviewed this book! From the title, I would have guessed it was about backyard flocks — but it really sounds like it’s about so much more, including how we as a society treat chickens. Important ideas!